Millard Roofing offers insulation inspections to help homeowners evaluate their energy usage and performance. Energy Star maintains that an attic that has been well insulated can help homeowners save up to 20% on their heating and cooling energy bills every year. Our insulation inspection involves checking the current insulation levels in your attic. We will immediately let you know whether or not you are losing money by having inefficient insulation. Energy costs have been steadily rising, which means that insulation is becoming very important to homeowners and business owners as time goes on. Millard Roofing estimators are familiar with and offer a wide variety of products to insulate every nook and cranny of your attic. Our products and techniques will be sure to bring you the greatest value and efficiency in the industry. We understand the value of time, so the entire insulation process will generally take no more than 2 hours. These estimations are based on a 1,000 square foot attic that has a current R-value of R-30. Millard Roofing’s expert installers will make sure the insulation is properly placed to maximize the insulation of your attic. 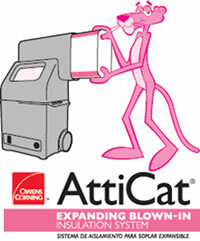 Our AttiCat machine works so that the Fiberglas™ Insulation releases and expands completely inside the machine. We use a fully enclosed, low dust insulation system. Millard Roofing Professionals can provide you with an attic analysis. Call today to arrange your inspection! Adding insulation to your attic is simple when you use the Millard Roofing AttiCat Insulation Blowing Machine. This machine conditions the AttiCat Expanding Blown-In PINK Fiberglas insulation by both breaking it up and fluffing it. This process adds millions of tiny air pockets, which gives the material its insulation power. The insulation we use is conditioned further as it travels through the hose. More and more air pockets are added as the insulation bounces its way to your attic. 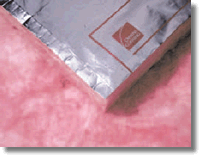 Also, Fiberglas insulation does not settle, which means it will maintain its energy-saving R-value for a long time. We provide timely, accurate and detailed estimates – in writing and accompanied by digital photography. We are responsive – arriving when we say we will and completing the job on time and on budget. We use only the best people and products — so your roof looks great, adds value and provides protection. We work as an advocate for our clients — ensuring the recommendations we make are paid for by insurance.